In this tutorial we will be going over how to create gorgeous in-camera flared effects that can add a lot of depth and interest to a simple portrait image. To do this we will be using a glass prism which can be found on any number of online retail sites. The glass prisms are generally used for school science experiments so they're readily available and very inexpensive. The prisms are very easy to use out on location as you simply hold them in front of the lens and shoot away. If you're looking to use them in a studio environment though there are a few key things to bear in mind to maximise the flared effect that creates that signature look. In this setup we'll be keeping it super simple with just two lights and a backdrop. One light to illuminate the model and one light to shine into the prism to create the effect. Even the backdrop used here is a simple window blind so the whole thing is very cost effective and I even shot this in my front room so it doesn't even need much space either. Prisms reflect the surrounding scene into your lens so shooting with prisms indoors is a little tricker than when you're outside. They're harder to use indoors because quite often there's nothing else that interesting around you to reflect into the shot. In this instance we'll be using an additional light behind the model to shine back into the scene to create this flare and additional interest. If you're happy shooting with off-camera flash and want to get a little more creative, this is a great next step to add some interesting elements. If you're going to be shooting outside on location with available light then simply setting your camera to aperture priority will be enough. To get the most out of this technique though, a wider aperture of around f2.8 to f5.6 will yield the best results. If you're in a studio then setting the camera to manual mode will be best. Have your starting settings at a wider aperture, around f2.8 to f5.6 should be fine. Set the ISO 100 (as low as your camera will go) and your shutter speed to 1/160, this will be fast enough to limit ambient light but still sync to the flash. It's worth thinking about which modifier you'll be using for your key light. I used a 22" white beauty dish here but a small 60cm softbox or umbrella would do equally well too. Using any of these modifiers will give you a softer more flattering light on the subjects skin. I prefer to use the softer lighting modifiers like these over the less flattering modifiers like grids and snoots. Roughly translated, the larger the light source the softer and more flattering the light will be. Also the other benefit to using larger modifiers like this is that the light will spill onto the background behind the model. This eliminates the need for an additional background light. You want to position your key light above the models head, angled down and about 2-3 ft away. Your subject should be about half way from the background to the key light, by doing this the key light should now illuminate the model and spill onto the backdrop to light that as well. I'm using strobes here but speedlights will be just as good. You can either take a light meter reading or take a shot and review the results. Remember we are adjusting the lights to the camera not the other way around. If the shot is too bright then turn down the power of the light, don't adjust the camera to compensate. When using prisms in your photography it's important to pay close attention to your backdrop. This becomes less important when shooting on location because the whole world is your backdrop but in a studio environment the prism will distort the field of view so make sure that you have a backdrop large enough to accommodate for this effect. I actually shot this in my front room so I simply used a window blind as a backdrop. They're relatively inexpensive, and there's loads of variety plus it can easily be rolled up and stored away after use. 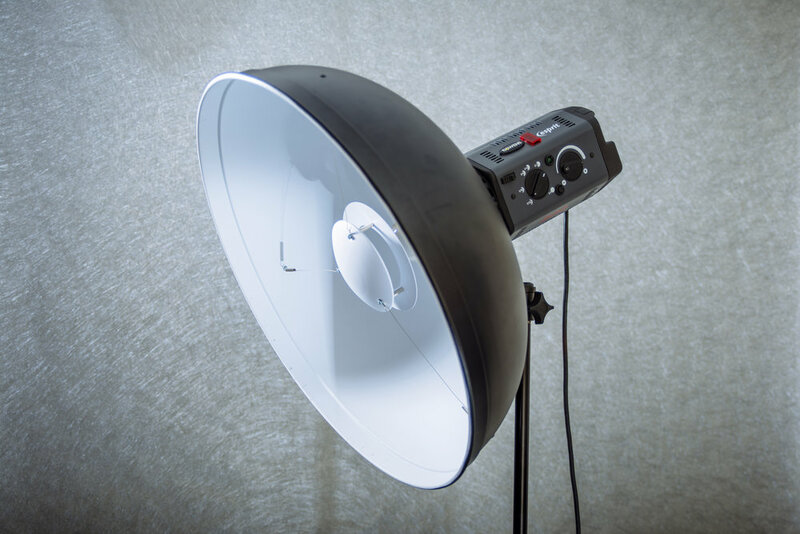 This flare light was simply an open reflector dish. The trick here is this flare light will double up as our hair light as well as the light that generates flare into the prism we're holding to get the lovely soft glow effect in-camera. Place this light behind the model and off to the side just out of shot. A good starting point on the power of this light is to set it about one stop brighter than our key light, this will ensure a strong flaring effect through the prism into the camera lens. Take a few shot and adjust the power until you get the desired amount of flare into the lens. Backdrop - This is a very inexpensive silver window blind. We will be shooting at a wider aperture so this wont be in focus. Model - Position the model a couple of feet away from the backdrop. Get them correctly placed and the key light will fall off nicely onto the backdrop simultaneously lighting them both. Keylight - Beauty Dish. You can substitute this for a softbox or umbrella but you should position it above the models head and about 2-3 feet away. 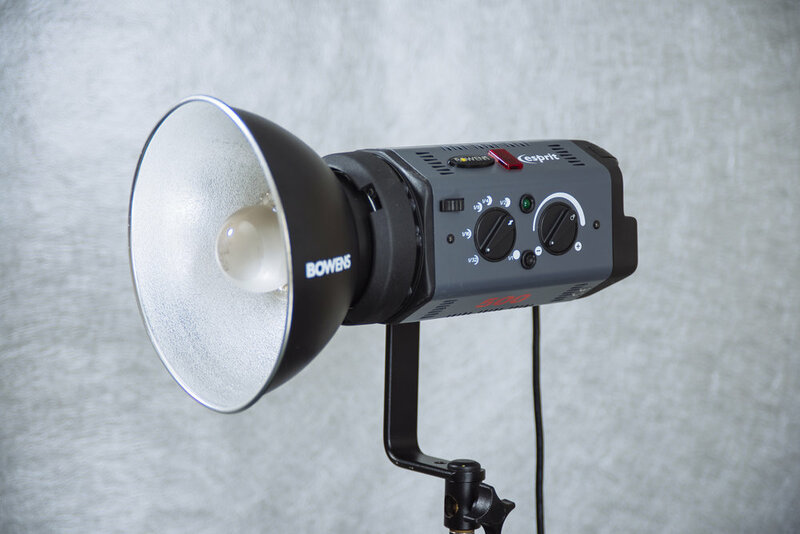 Flare Light - Open wide reflector. This will be the light positioned just over the models shoulder and pointing towards the lens and prism we will be holding. Now the fun part begins. Simply start shooting away whilst holding the prism in front of your lens at different angles. Try it with the prism held horizontally above the lens or to the side and don't forget to try twisting it as well to produce different looks. One thing to keep in mind is to always keep the prism quite close to the lens and to just have it creeping into shot, don't have it dominating the frame to much otherwise it will obscure the image entirely. Experimentation is key here as there is no right or wrong way to do this, only what you prefer. Using prisms indoors can be tricky at first but if you persevere with them you can get some beautiful in-camera effects like the flare and rainbow effects you see here. You needn't stop with just the prism in front of the lens, in fact you can try any number of glass objects to produce some stunning results. Think about trying simple wine glasses and other glassware or even crystals. Crystals give a slightly more distorted look compared to the prism but simply holding a crystal or several crystals directly in front of your lens can create some gorgeous colours and bokeh effects. One quick tip to bear in mind for best results is to try and get your hands on some antique crystals, these slightly older crystals were coated in a very thin film of lead which gave them those gorgeous rainbow colours as you look through them. You can get away with shining lights directly into them to get some great bokeh effects too. Using crystals or anything vaguely transparent that refracts the light can be shot through. Experimenting with a variety objects can produce some vey interesting results. As always, questions comments and ideas are always welcomed :) If you've given this a go yourself then please feel free to let me know as I'd love to hear how you got on. Thanks again for reading and good luck!